That’s right Alaska. You know all about Alaska right? Deadliest Catch, Yukon Men, Denali National Park, Klondike Gold Rush, and perhaps one of my favorites; Grizzly Adams. Well, Alaska has more to offer than just the bits and pieces we see on tv or learned about in school. Comparing Alaska to what we’ve seen would be like comparing Jersey to Snookie and the Sopranos, while there may be some truth there is a lot more to it than meets the eye. 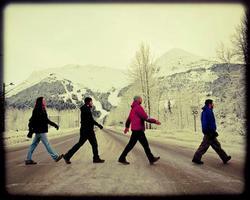 Alaska has a rich musical history. No, it isn’t rock, it isn’t jazz, it isn’t blues. It is earthy they way it should be, it is the song of the peoples native to its soil, long before we set foot there as miners bringing with us the Early American Folk, people such as the Inupiaq and the Aluet. Music in Alaska has evolved as it has everywhere else, they have jazz festivals, they have a local opera festivals. They have what we have but the only difference is that they still have the beauty of the land and most musicians in the area draw on the folk music of yesteryear, and really that folk music is feel good music. This is where I feel this weeks band fits in perfectly. They are Alaskan music. They are Big Fat Buddha hailing from Anchorage. I will say that they are like Jewel when she first made her rounds, in the early days, if she had been accompanied by a band. She was barefoot, wearing jeans and a tshirt with feathers hanging from the neck of the guitar, she was folksy and she was real. Big Fat Buddha, yep, these guys are real and they formed in a way that is one step beyond the posting in the paper or bar bulletin board.. It all started with a posting on Craigslist. Founding member, Brad Fidel, posted one evening in 2010 an ad looking for fellow musicians who like the Beatles and Dylan. His ad was answered by singer/songwriter Matt Brenna. These two musicians met and hit it off, they were onto something. A friend of Brad’s, Jeff Arms who just so happens to be a percussionist heard what his friend was up to and liked the idea so much he joined in. Recently they added drummer Kyle Drake. Big Fat Buddha was born. These guys play a nice combo of rock and funk, compare them to a jam band of your liking, Grateful Dead or Phish or compare them to Rusted Root. I would make that comparison more because that’s what they remind me of. Either way, it’s music that gets your feet tapping and your body moving. Just watch the videos on YouTube, the crowd is not sitting around bored, they are all moving and having a good time. The songs are well written, the vocals are smooth and pleasing to the ear and there is just enough jam factor without it being overkill. The first song that you come across on their website ( http://www.BigFatBuddhaBand.com ) “You Drive me Crazy (Baby Blue)” is quite catchy. If you like what you hear with that song you will definitely like the rest of what you hear. The sound is a familiar mixture of rock and funk, not too hard, not too soft, just right and it is fun. It would make a good soundtrack to a cross country drive, tops down, wind in your hair with not a care in the world. The website is http://www.BigFatBuddhaBand.com and there you can listen to some music, read their blog, look at some pictures, see where they are playing etc. It’s all there. You can even buy their self titled cd, which I would recommend. If you liked one of their songs you are sure to like them all. They are currently in the process of hitting the studio to work on a second release. They also have additional videos to view on YouTube. Check them out. This is one of those bands that I will do some follow ups on. The lower 48 needs to know what these guys are up to.